Liu, X., et al. Detection of Mandarin in Orange Juice Beverage by SNP-based PCR-RFLP-CE Assay. (2017) J Food Nutr Sci 4(2): 117- 121. © 2017 Liu, X. This is an Open access article distributed under the terms of Creative Commons Attribution 4.0 International License. In this work, a new method that combines the use of SNP together with PCR, RFLP and Capillary Gel Electrophoresis (CE) is developed and applied to the detection of mandarin in orange juice beverage. The SNP loci in TrnL-trnF gene of different orange varieties and mandarin varieties was utilized to select the appropriate restriction enzyme digestion, digestion products were detected by CE, the assay was relatively with a limit of detection of 5% v/v. In addition, this study finally acquired a relatively better linear relationship between concentration of the fragment and the adulterated ratio in the initial quantitative analysis. Fruit-based processed products especially juice were more and more popular with consumers for their characteristics of health and nutrition, but now, juice adulteration is a serious social problem, according to the statistics, 50% - 80% juice in the international market is adulterated to varying degrees, such as orange juice added in mandarin and grapefruit, apple juice added in pear juice and grape juice, red berry juice added in apple juice etc[1-3]. There are two case of Juice adulteration: accidental substitution and fraudulent substitution, accidental substitution may be cause by inadequate cleaning of juice process equipment, and fraudulent substitution generally occurs as a result of deliberate addition with cheaper additives including water, pomace extracts, low-price juice, etc. Juice adulteration of the fruit species can be detected by physical and chemical identification, including mass spectrometry, chromatography and spectroscopy[4-6]. However, their methods are likely to be restricted by the raw materials variety, environmental growth and process conditions. DNA-based approaches developed in recent years have been utilized to address the adulteration of meat, fish, dairy product[7-9], and gradually began to apply on the fruit species. At present, the main DNA-based method applied in the fruit juice adulteration were PCR method[10-12], qPCR method[13-15], HPLC method, PCR - RFLP method[16-17], etc. Nevertheless, no PCR-RFLP-based assay for identification of closely related species as orange and mandarin has been reported. The most common adulteration of orange juice is mandarin juice, there are two kinds of possible reasons, one is to improve the quality of orange juice, and the other is the contradiction of low demand and mass production resulting from the seasonal surplus and the particularity of not suitable for retail. Orange (Citrus sinensis) and mandarin (Citrus reticulate) belong to the same Citrus species, relationship of varieties is closer, and few polymorphic loci is available, therefore, when applying genetic testing method to detect mandarin in orange juice, there are two difficult points, first is the selection of specific gene, which need to be conserved and contains appropriate polymorphic loci; the second is selection of the methods in the polymorphic site detection, which need simple and low cost. A PCR heteroduplex assay on amplification of trnL for detecting mandarin in orange juice has been previously reported, this method is relatively cumbersome and time-consuming as a result of Polyacry- Lamide Gel Electrophoresis (PAGE) analysis. Recently, DHPLC (Denaturing High Performance Liquid Chromatography) is applied to detect mandarin by 8bp discrepancy of amplification product between mandarin and orange, but it is relies on a skilled procedure, cannot be widely used. More recently, real-time PCR is developed according to the diversity of SNP loci in mandarin and orange[19-20], this assay can reach a lower detection limit-1%, but the use of dual probe greatly increases the detection cost. PCR-RFLP technique can detect the polymorphic loci by digesting PCR product through restriction endonuclease, simple and low-cost, and this method has been applied on species identification of juice. It has been reported that this method successfully identified six fruit species in fruit juice including apple, blueberry, elderberry, grape, pear and pomegranate. Moreover, this method may also discriminate the closely related species as orange (Citrus sinensis) and grapefruit (Citrus paradise). PCR-RFLP method solve the problem of detecting polymorphic sites, and trnL-trnF gene which contains suitable conserved SNP loci solve the problem of specific genes, therefore SNP-based PCR-RFLP method will have a huge potentiality for detecting mandarin in orange juice. In this study, trnL-trnF gene of different orange varieties and mandarin varieties were evaluated to select the appropriate SNP loci, and then select the appropriate restriction enzyme digestion according to the SNP site, digestion products were detected by CE, finally PCRRFLP-CE method was established to detect mandarin in orange juice. 10 kinds of fruits commercial juice sample were prepared from local market including orange (four cultivars: tiancheng, jicheng, xuecheng, bing tang cheng), mandarin (four cultivars: shang tang ju, jinju, luju, gong ju), apple, pear, peach, papaya, pineapple, hawthorn, grape, banana. Mixed juices containing a series of proportions (2.5%, 5%, 10%, 15%, 20%, and 50%) of mandarin were prepared by mixing the corresponding volumes of fresh juice which was prepared in our laboratory by squeezing. Commercial juice samples including 5 orange juice beverage, 1 grape juice beverage and 1 lemon juice beverage. For fresh fruit samples, total DNA was extracted from 0.25 g of each pulp, as previously described. For juice nectar and clarified juice, total DNA was extracted from 1mL and 30 mL juice samples, respectively, as previously described. 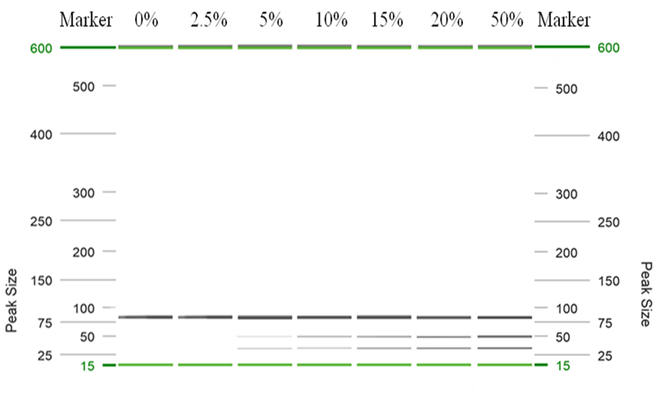 PCR amplification was performed on the amplification system (Biometra, UK) with Primers (Table 1). Reaction system (25 μL) was performed with 1 × PCR buffer (TransGen, China), 800 mMdNTP (TransGen, China), 20 nM forward primer and 20 nM reverse primer, 0.2 μL 20 mg mL-1 bovine serum albumin of (BSA; Takara, Japan), 1.25 units of Taq DNA polymerase (TransGen, China) and 5 - 10 mg diluted DNA. The PCR amplification of trnL-trnF genewas performed as follows: 95°C denaturation for 4 minutes, before 10 cycles of 95°C for 30 seconds, 60 - 55°C annealing 30 seconds, 72°C extension 30 seconds. After each cycle the annealing temperature was lowered in 0.5 °C increments. The 10 cycles were subsequently followed by 30 cycles of denaturing at 95°C 30 seconds, 55°C annealing 30 seconds, 72°C extension for 30 seconds and final extension at 72°C 2 min. Restriction enzymes were used in accordance with the manufacturer’s instructions. Reaction system of RFLP: Bciv I (10000U/ml) (NEB, USA) 0.4 μL, 10 × Buffer 2 μL, PCR amplification product 17.6 μL. Reaction program of RFLP: 37°C for 3h. CE detection and analysis was carried out using QIAxcel Advanced System (QIAGEN Germany) with QIAxcel DNA High Resolution Kit. The proposals for identification of plant species have been put forward: rbcL, trnL-trnF, matK ITS, trnH-psbA, accD etc. Among these, trnL-trnF belongs to chloroplast gene and has adequate loci of polymorphism, moreover it is easy to amplification, trnL-trnF has been widely used in most plant species in the identification of human nutrition, which was reported that application of this gene has been started for detecting mandarin in orange juice[11,19,20]. According to the low integrity of DNA caused by processing condition for commercial juice, when selecting the primer, the primer whose amplified fragment length is short (less than 200 bp) should be a prior choice. Therefore, in this study, taking this into consideration, three pairs of primers of trnL-trnF gene were selected firstly, amplified fragment length was 191 bp, 103 bp, 83 bp, respectively, details in (Table 1). Addition, this study is based on RFLP-PCR method, thus the selection of restriction enzyme is one of the key point. There are two things to be noticed: First, the selected restriction enzyme is available; Secondly, the gap between the fragments after cleavage by restriction enzyme cannot be too small, because currently the most sensitive detector should be capillary electrophoresis and its highest resolution can reach 3 - 5 bp. GENtle software was used to scan the target sequence according to the primers and trnL-trnF sequence of different varieties of orange and mandarin loaded in NCBI (Table 2). Followed by restriction endonuclease analysis, wherein the 103 bp sequence cannot find a suitable endonucleases for too small gap between cleavage fragments, the 191 bp sequence and the 83 bp sequence can find a suitable endonuclease, respectively Bfa, BciV, but when preliminary experimenting using Bfa I, we found that 191 fragments of mandarin also has not cleavage (Figure 1-a). For the 83 bp fragment of trnL-trnF gene, orange and mandarin have only one SNP site. To verify the conservative of the SNP site, researchers used 20 different kinds of mandarin, 10 hybrid kinds of mandarin and 25 kinds of orange, 3 kinds of hybrid orange to sequence, the results showed that the SNP site of all mandarin and its hybrid kinds are “G”, and the SNP site of all orange are “T”. Meanwhile, this study use the trnL-trnF gene of 4 kinds of orange (Washington navel, Tarocco, Navelina, Barlerin), 2 kinds of mandarin (Nova, Encore) and a cross-breed of mandarin and grapefruit (Minneola) which is different from the above-mentioned samples, after the comparison of the 83 bp sequence by GENtle software, the result turns out to be the same which states a high conservative SNP site, therefore the trnL-trnF of 83 bp will be used as the destination gene for the detection of mandarin in orange juice in this study. Use GENtle to do the restriction enzyme analysis of the trnL-trnF gene from 83 bp of orange and mandarin, the result was quite good after a test of the BciV I restriction enzyme see (Figure 1-b), thus BciV I were chosen as the restriction enzyme. Figure 1: Bfa I and BciV I RFLP analysis of trnL-trnF gene in juice samples by gel electrophoresis. M: Trans DNA Marker II; 1: Orange (tiancheng); 2: Mandarin (shang tang ju); 3: Orange (jicheng). BciV I was used to cleave the amplification product of trnL gene for four orange juice, four mandarin juice, one mixed juice by orange and mandarin, the CE profile was shown in (figure 2), the theoretical amplicon size was 83 bp, and the theoretical BciV I cleavage product were 49 bp and 34 bp. The CE measured values varied from 82 bp to 83 bp, from 49 bp to 50 bp, from 33 bp to 34 bp, respectively, within the range of theoretical error. RFLP profile of nine samples was consistent with the theoretical map: 83 bp of four mandarin spices were cleave to 49 bp and 34 bp, while 83 bp of four orange spices not be cleaved, mixed samples appear 83 bp of orange spices, 34 bp and 49 bp of mandarin spices, a total of three bands. Figure 2: BciV I RFLP analysis of authentic orange and mandarin samples: lanes 1 - 4: orange (tiancheng, jicheng, xuecheng, bing tang cheng); lanes 5 - 8: mandarin (shang tang ju, jinju, luju, gong ju), lanes 9: squeezed juice with orange and mandarin. In order to verify the specificity of the method, 8 kinds of fruits including pear, apple, peach, papaya, pineapple, hawthorn, grapes, bananas were detected by this method, the result shown in (Figure 3), 83 bp of 8 fruits were all not cleaved, indicating that this method has a good specificity. Figure 3: Specificity of PCR-RFLP-CE assay. a: apple; b: pear; c: peach; d: papaya; e: pineapple; f: hawthorn; g: grape; h: banana. To verify the detection limit of the SNP-based PCRRFLP-CE method used in the assay for mandarin detection in orange juice, the orange juice is mixed with mandarin in different volume ratio (0%, 2.5%, 5%, 10%, 15%, 20%, 50%), then extracted the DNA from the sample for PCR-RFLP-CE analysis, the result is as (Figure 4) which the 34 bp and 49 bp band appeared at 5% mandarin in orange juice, this proves that the detection limit is 5%, which is the same as the qPCR or the more complicated PCR production based heterogeneous hybrid analysis, but higher than the dual-probe method which is 1%, however this method has less professional dependence and a lower cost, meanwhile this method can meet the detection limit of 3% - 5% in a single composition fruit juice. 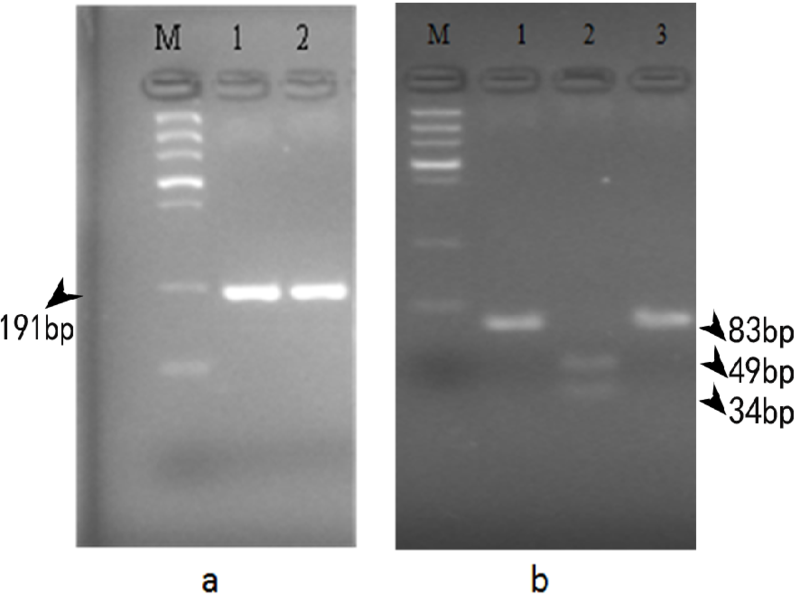 Figure 4: Sensitivity of the PCR-RFLP-CE test for different proportion of mandarin in orange juice. The heat processing, add of additives and antiseptic of Commercial fruit juice could affect the DNA to some extent. Studies showed that fruit juice is usually heated from 75°C - 85°C to 99°C for 1 - 3 min to gain a better looking and avoid decay[24,25], which could destroy the integrity of DNA. It is reported that the length of 250 bp fragment can be amplified. In this study, we selected 83 bp which should be able to amplify in commercial juice theoretically. Meanwhile, in order to avoid any possible suppression to the PCR reaction generated by the additives and aseptic, the reaction system used extra 0.2 μL 20 mg/mL Bovine serum albumin (BSA TARAKA), which also can help with the suppression of endonuclease. Use 8 kinds of commercial fruit juice in the market as template for PCR-RFLP-CE analysis, the result was shown in (Figure 5), all of 8 commercial fruit juice have amplified the 83 bp band and without being cut by BciV I, just same as the product label. Figure 5: Detection result of PCR-RFLP-CE for 8 kinds of commercial juice. All the studies on the detection of mandarin in orange juice made an initial quantitative analysis, the correlation between fluorescence value in the real-time fluorescent quantitative analysis and mixture percentage was utilized to do the initial quantitative analysis, the CT value in dual-probe analysis was also used to do the initial quantitative analysis. In a word, these quantitative methods are indirect, whereas QIAxcel High Resolution Kit from QIAGEN can analyze the size and concentration of the fragment according to the size and concentration of size marker, which is simpler than the former two methods. (Table 3) enumerated the concentration data of the orange juice mixed with different percentage of mandarin detected by PCR-RFLP-CE method, in order to acquire a better quantitative correlation, comparing the 6 parameter 34 bp concentration, 49 bp concentration, (34 bp + 49 bp)concentration, 34 bp concentration /83 bp concentration, 49bp concentration /83 bp concentration, (34 bp + 49bp) concentration /83 bp concentration respectively with the mixture percentage, using Excel to build a curve adopt the mixture percentage as x-axis and the 6 parameter as y-axis, result as (Table 4). Theoretically, the curve generated by parameter is more accurate, because in the same reaction system of RFLP, 0.4 μL enzyme can fully digest the pure mandarin DNA amplified 83 bp fragment into 34 bp and 49 bp with the concentration of 0.42 ng/μL and 0.51 ng/μL respectively, therefore 0.4 μL enzyme and 3 hours digestion time is enough to digest the 83 bp mandarin fragment for sample adulterated between 2.5% - 50%, hence parameter has a better quantitative correlation with the mixture percentage, in contrast, parameter shows the ratio between digested concentration and indigested concentration, this should be correlated with the ratio of the content of mandarin and orange, but not the adulterate ratio. (Table 4) confirms this point very well, the curve of parameter has a higher correlation as the value 0.999 is higher than the curve of parameter . For parameter and , the fragment concentration is lower which may result in inaccuracy; therefore the curve of parameter is the best choice. The assay presented here is a sensitive and accurate methodology for the detection of ingredients in food samples, which may be easily adapted to other food applications requiring the differentiation of closely related species or cultivars, for which few species-informative sequence polymorphisms are available. It would be expected that a relative quantitative assay after normalization with a matrix-adapted reference sample may be performed to ascertain the approximate proportion of ingredients in food samples. The method developed in this study might provide an effective control tool to the juice industry for determining the adulteration of mandarin in processed orange juices. Author contributions: Xiu Liu and Ling-qian Qi designed the study and interpreted the results. We thank sincerely Ting-hui Zhou from Qiagen Co., LTD. for the kindly supply of technique and kits. 1. Liu, X.M., Xiao, G.S.H., Chen, W.D., et al. Comparative study on DNA extraction from fresh fruit. 32(6): 87-91. 2. Su, G.M., Hu, X.SH. Review on the new progress in juice authenticity assessment. (2009) Food and Fermentation Industries 35(6): 151-156. 3. Chen,Y. Comparative study on DNA extraction from fresh fruit. (2013) China fruit news 30(6): 39-41. 4. Febe, G.W., David, H., Donald, S.M., et al. Detection of fruit juice authenticity using pyrolysis mass spectroscopy. (2000) Food Chemistry 69(2): 215-220. 5. Leon, L., Kelly, J.D., Downey, G. Detection of apple juice adulteration using near-infrared transflectance spectroscopy. (2005) Appl Spectrosc, 59(5): 593-599. 6. Chen, X.M., Li, J.M., Li, Y.X., et al. Achievements of study on application of artificial neural network to beverage industry. (2005) Beberage Industry 8(1): 8-12,22. 7. Herrero, B., Madrinan, M., Vieites, G.M., et al. Authentication of Atlantic Cod (Gadusmorhua) Using Real Time PCR. (2010) Agric Food Chem 58(8): 4794-4799. 8. Fajardo, V., González, I., Martín, I., et al. Real-time PCR for detection and quantification of red deer (Cervuselaphus),fallow deer (Damadama),and roe deer (Capreoluscapreolus) in meat mixtures. (2008) Meat sci 79(2): 289-298. 9. Qin F.F., Deng H.L., Guo X.D., et al. Detection of Plant Ingredient in Milk by PCR Method. (2008) Food science 29(6): 234-236. 10. Knight A. Development and validation of a PCR-based heteroduplex assay for the quantitative detection of mandarin juice in processed orange juices. (2000) Agro-Food-Industry Hi-Tech 11(2): 7-8. 11. Han, J.X., Wu, Y.J., Huang, W.S., et al. PCR and DHPLC methods used to detect juice ingredient from 7 fruits. (2012) Food control 25 (2): 696-703. 12. Popping B. The application of biotechnological methods in authenticity testing. (2002) J Biotechnol 98(1): 107-112. 13. Palmieri, L., Bozza, E., Giongo, L. Soft Fruit Traceability in food matrices using real-time PCR. (2009) Nutrients 1(2):316-328. 14. Li, F.W., Zhang, S.H., Ye, J., et al. (2013). Real-time PCR assay for detection of banana ingredients in foods. Food science 34(12): 243-246. 15. Han, J.X., Huang, W.S., Wu, Y.J., et al. Study on the biotechnological adulteration detection of pear component in fruit by real-time fluorescence PCR method. (2010) J Chinese Institute of food Sci Technol 10(1): 207-213. 16. Scott, M., Knight, A. Quantitative PCR analysis for fruit juice authentication using PCR and laboratory-on-a-Chip capillary electrophoresis according to the Hardy- Weinberg law. (2009) J Agric Food Chem 57(11): 4545-4551. 17. Clarke, M.A., Dooley, J.J., Garrett, S.D., et al. An investigation in the use of PCR-RFLP profiling for the identification of fruit species in fruit juice. Food Standards Agency, Foodbase, (2008) Open Access Research Repository. 18. Mooney, B., Chappell, L., Knight, A.I. Evaluation of a polymerase chain reaction-based heteroduplex assay for detecting the adulteration of processed orange Juice with mandarin juice. (2006) J AOAC Int 89(4): 1052-1060. 19. Aldeguer, M., López-Andreo, M., Gabaldón, J.A., et al. 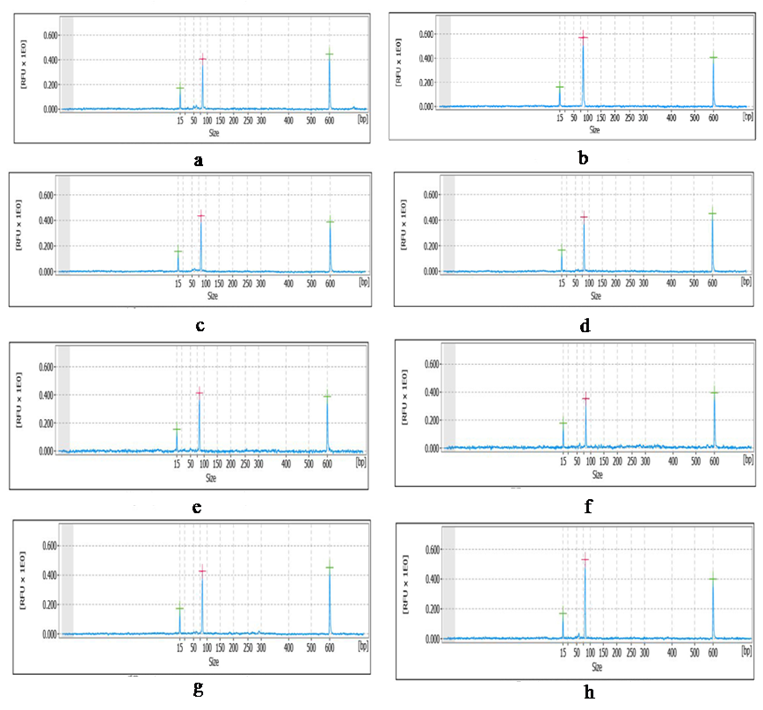 Detection of mandarin in orange juice by single-nucleotide polymorphism qPCR assay. (2014) Food Chemistry 145: 1086-1091. 20. Pardo, M.A. Evaluation of a dual-probe real time PCR system for detection of mandarin in commercial orange juice. (2015) Food Chemistry 172: 377-384. 21. Qi, L.Q., Liu X., Ding M.X., et al. Comparative study on DNA extraction from fresh fruit. (2015a) Food Research and Development. 22. Qi, L.Q., Liu X., Ding M.X., et al. Comparative study on DNA extraction from Juice beverage. (2015b) Food and Fermentation Industries 41(12): 226-230. 23. Taberlet, P., Coissac, E., Pompanon, F., et al. Power and limitations of the chloro- plast trnL (UAA) intron for plant DNA barcoding. (2007) Nucleic Acids Res 35(3): e14. 24. Ros-Chumillas, M., Belissario, Y., Iguaz, A., et al. Quality and shelf life of orange juice aseptically packaged in PET bottles. (2007) Journal of Food Engineering 79(1): 234-242. 25. Ingallinera, B., Barbagallo, R. N., Spagna, G., et al. Effects of thermal treatments on pectinesterase activity determined in blood oranges juices. (2005) Enzyme and Microbial Technology 36(2-3): 258-263. 26. Weiss, J., Ros-Churnillas, M., Pena, L., et al. Effect of storage and processing on plasmid, yeast and plant genomic DNA stability in juice from genetically modified oranges. (2007) Journal of Biotechnology 128(1): 194-203.